All month 123 Dentist has been offering our best ever promotion on Invisalign, the clear alternative to braces. It’s almost hard to remember a time when braces weren’t metal wires fastened to your teeth, but Invisalign is helping to make the past feel more distant. Now dentists and patients have a better option, one that achieves the same result without the downside. Invisalign costs about the same as regular braces, treatment takes around the same time and you can eat and drink what you want without worry. Invisalign represents the most current and best solution for most patients looking to straighten their teeth or correct any number of other issues, from jaw alignment to crowding and gaps. But what came before? How did we get here? To close out our month long look at this special 123 Dentist Promotion we are taking a closer look at the history of braces. Some of the very first braces were crude designs found on mummies in ancient Egypt. And while we could make some joke about how long it took to correct crooked teeth (3-5000 years?) it’s just impressive that a culture thousands of years old was able to envision correcting teeth. The first braces were made of cord from animal skin attached to teeth the same way a modern dentist would attach wire braces. Thankfully you don’t have to use this cord anymore, it was commonly referred to as ‘cat gut’ for reasons we don’t care to know. As early as 1000 BC Archeologists have suggested the first orthodontic procedures were practiced in Greece. 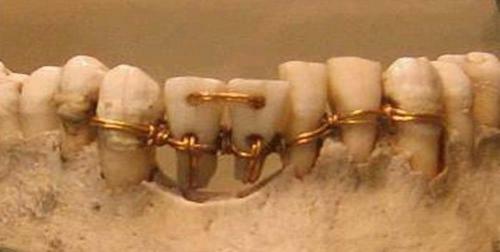 Ancient Etruscans used mouth guard type devices to protect a recently deceased body and keep the wearer’s teeth from collapsing inwards after time. Researchers attribute this to a death ceremony that prepared the body for the afterlife. The Etruscans preceded the Romans in Italy. It was actually the ancient Romans who first attempted to straighten teeth amongst the living. Aulus Cornelius Celsus documented his attempts to straighten teeth with the force of his own hand, applying pressure at certain regular points. Celsus actually reported success in his experiments, but it’s a little difficult to back up his work now. We do know that for years archeologists have found roman burials with remains featuring a small gold wire on the teeth or what is left of them. Theories suggest the wire, known as a ligature wire, were used for similar effect as Celsus intended. From the end of the Roman Empire until the rise of British and French Empires there wasn’t much in the way of advancements to orthodontics. We guess it’s a little hard to worry about straighter teeth when you’re facing the Black Death, the Crusades and are discovering the new world. Still, we wouldn’t see new advancements, or at least documented advancements until the early 1700’s in France. We really tried to come up with a fun title for this one, but couldn’t quite figure out the right one. Between 1728 and 1757 two books on dentistry were written by Pierre Fauchard and Pierre Bourdet. Fauchard was a fresh thinking, modern dentist for his time. He wrote a section of his book, titled “The Surgeon Dentist” about orthodontics and talked about several ways to straighten teeth. In particular he discovered a device he called a “Bandeu” which was similar to a mouthguard and was thought to help teeth stay in their intended position. In 1757 the dentist of the King of France, Pierre Bourdet, wrote his own book and expanded on Fauchard’s Bandeu device. Bourdet was able to improve the device in several ways, and made the important discovery that the rear wisdom teeth could be removed to avoid crowding, a common cause of crooked teeth in adults even today. The book titled “The Dentist’s Art” was popular for a long time and is an important part of dental history. It wasn’t until the 1900’s that the term “braces” became widely used, but we know that the first modern braces for teeth were actually created by Christophe-Francois Delabarre in 1819. A wire ‘crib’ was placed directly over each set of two teeth, in hopes of keeping them in place. 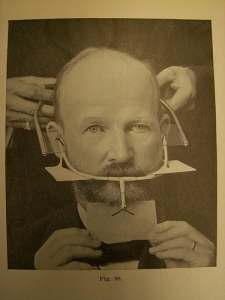 Dr. Edward Maynard added elastics to the system in 1843 to improve jaw alignment, similar to modern braces. E.J. Tucker improved the design 3 years later and made it more comfortable for patients. Another major achievement came in 1864 when Dr. S.C. Barnum created the modern dental dam. Our dentists still use a version of the dental dam today. It is a thin piece of latex that fits around the teeth, protecting the gums from work being done on the teeth. It is crucial in orthodontics to be able to fit braces (which until recently were made of metal) without damaging the gums. 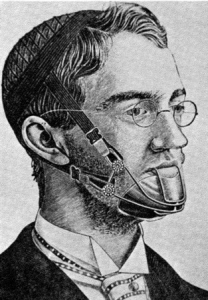 Without the dental dam, modern braces wouldn’t be possible. Unfortunately, up until the 1890’s most dentists were under the impression they needed to remove several teeth to make room for their techniques to straighten teeth. Just imagine getting braces but being told you’ll lose a few molars as a result. Henry A. Baker was the first to combine many of the previous techniques and make modern braces, well, more modern. Braces continued to change radically through two world wars and into the age of computers. Consider that the first ‘modern braces’ that used that name actually required wrapping wire around each individual tooth because bonding techniques weren’t strong enough to fasten wire to the front of teeth temporarily. These wires were tightened to adjust the teeth over time, and boy was it unpleasant. Dentists used whatever materials they could at the time. Everything from ivory to zinc was popular. Nothing was more popular than gold, and even today many of our dentists use gold for certain procedures. The ability to heat gold under relatively low temperatures and mould it into shape made it ideal for dentists, and it’s value and appearance made it attractive for patients of modern braces. Where do you think the fraise “look like a million bucks” came from? Just kidding, gold braces were pricey, but not that pricey. Still, gold was only so helpful since it would actually ‘melt’ over time. Then in the 1970’s, everything changed. Several breakthroughs, like the advent of stainless steel and dental adhesive to the front of the teeth made getting braces significantly less painful or damaging. The effects also improved and the timetable for how long you would have to wear braces shortened. 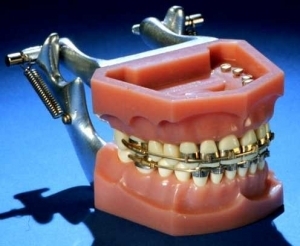 This was the true birth of modern braces. Several other techniques allowed for more hidden or ‘invisible’ braces, but the techniques never really gave people what they wanted, a truly invisible way to straighten teeth. It’s almost hard to believe that Invisalign wasn’t created until 1997. That’s the same year Titanic won best picture. Can you imagine Rose flying at the front of the titanic with wires in her teeth? Neither can we, you’re welcome. Zia Chishti, a Stanford University graduate with no dental background took the concept of the plastic retainer, the same one ancient Egyptians used 5000 years before, and figured out how to use it to straighten teeth, rather than just keep teeth straight that already were. Chishti took the idea to another Stanford graduate named Kelsey Wirth, and together they incorporated 3D imaging software to map out a patient’s mouth and create custom aligners that would slowly transform the wearer’s smile, just like braces, but without the manual tightening of wires or the unsightly ‘metal mouth.’ Invisalign was born, and was tested and perfected over 3 years before finally becoming available to the public in 2000. Since then it has grown in popularity over a decade and become the new standard for many patients seeking dental treatment. So to recap, we went from something called ‘Cat Gut’ to Invisalign in just 5000 years. Just remember that the next time you wonder if it would be cool to live in ancient Rome or Egypt. If you feel you’ve waited long enough (5000 years is a long time) to try Invisalign, you can speak to one of our dentists now about Invisalign and find out if it’s right for you. For a limited time you can save $1200 off Invisalign trays, x-rays and impressions plus whitening after your Invisalign treatment is complete.